What is a Special Dividend and why are they paid? I've been reading about special dividends in the press recently. What is the difference between these and a regular dividend? 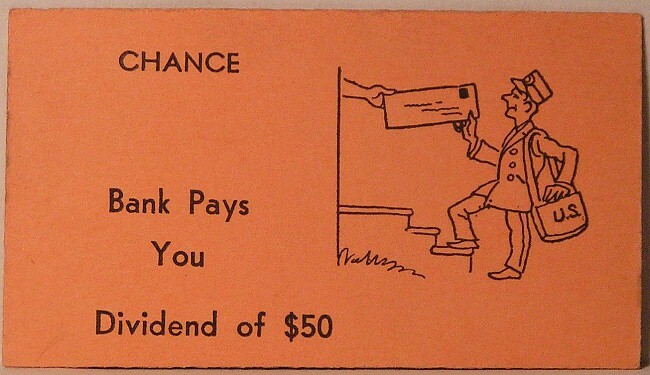 I have the image in my head of the classic Monopoly board game card where the postman brings an unexpected check. Am I anywhere close? From time to time, you might be fortunate enough to receive a special dividend. They're unusual or one-off payments to you and they're often larger than the regular payments. They can also be referred to as "Extra dividends". Let's say the company has had a large (sometimes unexpected) windfall and wants to distribute the cash to its shareholders. This unexpected windfall could come through the sale of a subsidiary, a tax rebate, the sale of a property or an unusually profitable trading period. One of my holdings received a bid for one of its subsidiaries last year and negotiated a price well above its carrying value on the balance sheet. The business decided to reward its shareholders with a special payment about 6x larger than the ordinary dividend it was paying at the same time. That was definitely a pleasant check to receive! If a company has been building up cash over a long period of time and cannot find suitable investments it often pays the shareholders this excess capital. If a company wants to change its capitalization structure. Effectively the business is saying that it has excess capital and can earn higher rates of return on equity by reducing its equity. By paying returning cash to shareholders, it comes off the company's balance sheet and the equity goes down. If earnings per share remain at the same level then your return on equity will go up which means your equity capital in the business is effectively working harder. If a business earns a reputation for paying extra dividends every few years then there is likely to be less turnover among shareholders. This can be important for management as long-term shareholders tend to be more patient and willing to let their business invest in longer term projects. It is important to realize that there are several options for a business when it receives an unexpected windfall and a special dividend is just one of those options for shareholder returns. Other uses for the excess capital can include share buybacks, acquisitions or the reduction of debt. We believe that returning cash to shareholders is preferable for a company under certain scenarios. These scenarios would be if the stock price is higher than its intrinsic value (making share buybacks look unattractive) or if there are no identifiable acquisition opportunities that would meet the required rate of return. We also think the company should pay close attention to its capitalization structure and adjust accordingly by making the appropriate shareholder returns. As you mentioned above, William, special dividends have been in the financial news recently. Jamie Dimon (JP Morgan CEO) has outlined his thoughts on the subject here.